Biola alumnus Kevin Willson (‘01) competed in the Super Bowl this year –– that is, his commercial “The Cowboy Kid” did in the Doritos “Crash the Super Bowl” contest. Each year, Doritos hosts a “Crash the Super Bowl” contest where one lucky winner has the chance to win $1 million. 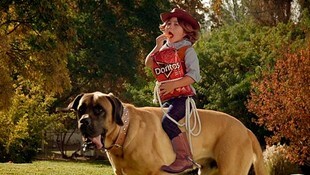 This year, Willson’s submission, “The Cowboy Kid,” was selected by Doritos as one of two finalists to represent the company in their Super Bowl commercial slots. “The Cowboy Kid” was voted by fans into the top five commercials, beating more than 5,000 other submissions. On Feb. 2, 2014, 111.3 million people tuned in to watch the Super Bowl XLVII — “The Cowboy Kid” aired in the final quarter of the game. With two weeks to film before submissions were due, Willson turned to his Biola alumni friends to put a team together. The team included Jeff Edwards (‘00), Dan McNeely (‘02), Dave Gill (‘03), Aaron Benitez (‘10), Greg Sanders (‘11) and Bob Perkins (‘00), many of which worked on film shoots together when they attended Biola. Willson has directed a total of eight Super Bowl commercial entries for the Doritos contest over the years, out of which three have aired during the game and one commercial, “Sling Baby,” won first prize in 2012. Each year his commercials have aired, they were voted amongst the top three best super bowl ads for that year by USA Today. After seeing their competitors’ commercial air in the first half of the game this year, Willson and the team were filled with anticipation to see if theirs would air later in the game. It only took seconds of the commercial airing for the Biola team to erupt into cheers at their Super Bowl party. “Even though it's my third Doritos contest ad to air in the Super Bowl, it's never diminished the joy and fun of airing to over 100 million people,” Willson said. Willson had his first big break with “Casket” airing in the Super Bowl in 2010. Leading up to this particular commercial, Willson substituted and taught special education while developing the craft that he loves on the weekends. “We need more people who love God in the entertainment business,” said Willson. “If you have a passion for storytelling and filmmaking, and feel God wants you in this tough business, take heart and believe that you can do this. It's a marathon, not a sprint." Written by Camryn Hudson, iBiola Intern. For more information, please contact Jenna Bartlo, Media Relations Specialist at 562-777-4061 or jenna.l.bartlo@biola.edu.